Remembering last year's bounty of produce from Shortt's, an organic farm located just down the road, here in Sandy Hook. Every Sunday afternoon from the end of June into November, I brought a half-share home and spread it out on the kitchen counter. Vegetables so lovely, lush, full of form and color, many photos were taken of them. This is a 5" x 7" acrylic painting on cradled panel. Referring to one of last year's photos, the painting was completed in one long sitting, on yet another snowy spring Saturday. 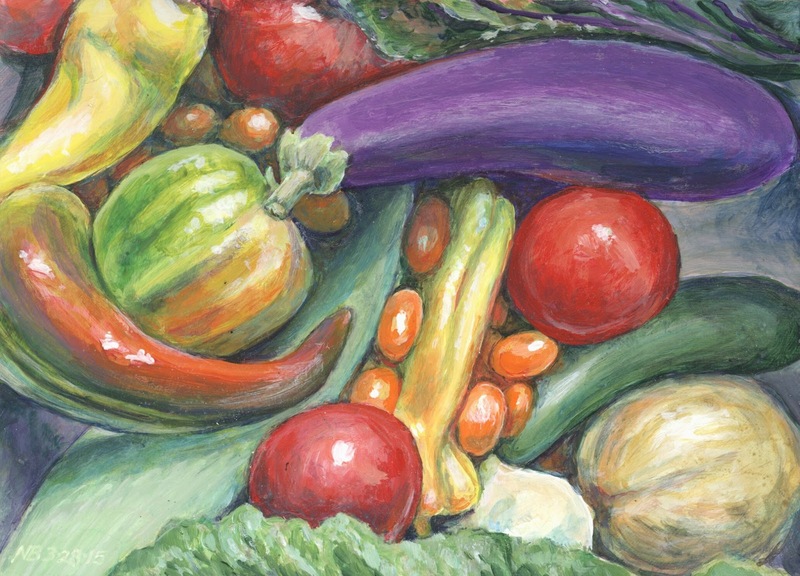 Eggplant, peppers, tomatoes, cantaloupe, cucumber, lettuce, and garlic: the ingredients for many good meals.